"When building a track, contact us first"
We are consultants on all phases of track and field event area design and layout and have unmatched experience in the field. I have participated in and coached track for fifty-eight years, the last forty-three of which have been on the national and international level. For several years I served as an informal liaison between the International Amateur Athletic Federation and the American Sports Builders Association. Part of my liaison activities involved working closely with the IAAF Stadium Working Group which published the IAAF Track and Field Facilities Manual. I was honored to be one of the individuals chosen to review the initial version of this volume. 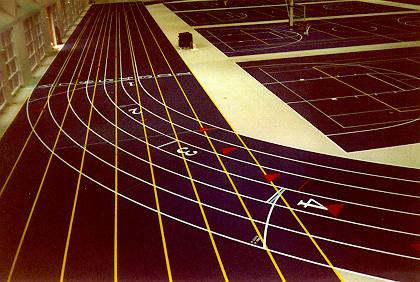 A number of years ago I was instrumental in the adoption of the IAAF color code for track markings by the NFSHSA and the NCAA. In 1996 the NFSHSA accepted my suggestion that the same hurdle spacing specified by the other governing bodies for the 110 meter hurdles be used, bringing a greater degree of uniformity to track marking. In 1999, the standard NCAA indoor sprint and hurdle distance was changed to 60 meters, bringing that body in conformity with USATF and the IAAF, a change that I advocated for more than ten years. We invite you to involve us in new jobs from the very beginning to take full advantage of our expertise. 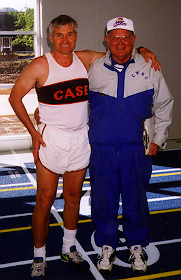 Shown above is Wayne Armbrust of Computomarx with the late Bill Sudeck, who was Head Track Coach at Case Western Reserve University for 46 years. The American Sports Builders Association (formerly U.S. Tennis Court & Track Builders Association) is recognized as the centralized source for information on track, tennis court, and indoor sports facilities for builders, manufactures, professionals and consumers. The Association was founded in 1965 by a group of contractors who recognized the need for an organization that could help them address their mutual problems, set industry standards, and keep them informed on issues pertinent to their business. Today, with more than 350 members, the ASBA supports the drive for excellence in the industry by maintaining that commitment to quality sports facility construction. Headquartered in Ellicott City, Maryland, the ASBA continues to take steps to raise the professional standards of the industry and to insure that consumers are receiving services of the highest quality. Computomarx has been a member of the ASBA since 1982. For 2013 Computomarx was a consultant for both the Outstanding Outdoor and Outstanding Indoor Track Facilities of the Year as selected by ASBA. Information for contacting the ASBA is shown below.